A new 28 Full Hook up RV park opened in January 2017. There are 28 pull thru spots with a clubhouse and small playground. 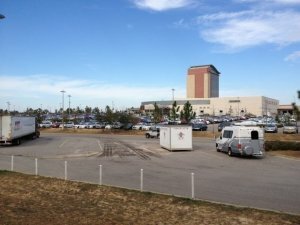 The Casino has a 24 hour shuttle to pick you up and return you to your RV. It is a nice place to stop for a few days. All of the Casino and Hotel amenities are available to RV Park visitors, such as: pool. spa,5 dining restaurants, a gym too. They have entertainment regularly too.